It is the chance of advancement into Asia now. We are lending a factory to the enterprise who aims at the advancement into Vietnam. 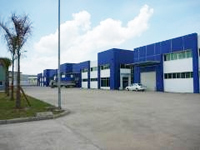 There is Fuji Precision Park completed in January, 2009 at 45 minute from Hanoi city. And near Noi Bai Airport , because it is adjacent to the Route 18, good of road traffic information is attractive. Do you take the first step of success story in the reliable environment facilities? We are thinking about help of the operation in Vietnam and careful support. Please feel free to contact us. Oct 21,2013 A vacant factory has came out. Please contact to us about the detail. Jun 10,2010 We made a homepage the latest. Jan 30,2009 We began the management of the Vietnamese rental factory.